There is a solution and it’s called a sinus graft or sinus lift graft. The oral surgeon enters the sinus either from where the upper teeth used to be or from the side of the upper jaw. The sinus membrane is then lifted upward and donor bone is inserted into the floor of the sinus. Keep in mind that the floor of the sinus is the roof of the upper jaw. After several months of healing, the bone becomes part of the patient’s jaw and dental implants can be inserted and stabilized in this new sinus bone. In severe cases, the ridge has been resorbed and a bone graft is placed to increase ridge height and/or width. This is a technique used to restore the lost bone dimension when the jaw ridge gets too thin to place conventional implants. In this procedure, the bony ridge of the jaw is literally expanded by mechanical means. Bone graft material can be placed and matured for several months before placing the implant(s). The inferior alveolar nerve, which gives feeling to the lower lip and chin, may need to be moved in order to make room for placement of dental implants in the lower jaw. This procedure is limited to the lower jaw and indicated when teeth are missing in the area of the two back molars and/or the second premolar, with the above-mentioned secondary condition. 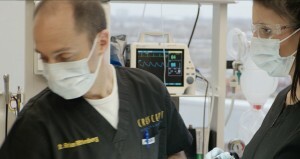 Since this procedure is considered a very aggressive approach (there is almost always some postoperative numbness of the lower lip and jaw area, which dissipates only very slowly, if ever), usually other, less aggressive options are considered first (placement of shorter implants if possible, etc.). Typically, an outer section of the cheek side of the lower jawbone is removed in order to expose the nerve and vessel canal. Then we isolate the nerve and vessel bundle in that area and gently move it out to the side. At the same time, we will place the implants. Then the bundle is released and placed back over the implants. The surgical access is refilled with bone graft material of the surgeon’s choice and the area is closed. These procedures may be performed separately or together, depending upon the individual’s condition. As stated earlier, there are several areas of the body that are suitable for obtaining bone from, for the purpose of grafting. In the maxillofacial region, bone grafts can be taken from inside the mouth, in the area of the chin or third molar region (back of the lower jaw), or in the upper jaw behind the last tooth. In more extensive situations, a greater quantity of bone can be obtained from the Iliac Crest (hip area) or the outer aspect of the tibia near the knee. When we use the patient’s own bone for repairs, we generally get the best results. In many cases, we can use allograft material to implement bone grafting for dental implants. This bone is prepared from cadavers and used to promote the patients own bone to grow into the repair site. It is quite effective and very safe. Synthetic materials can also be used to stimulate bone formation. We may even use factors from your own blood to accelerate and promote bone formation in graft areas. These surgeries are performed either in the clinic or in an out-patient hospital operating room setting, under IV sedation or general anesthesia. After discharge, bed rest is recommended for one day and limited physical activity for one-two weeks.